Bandsaws are capable of cross-cutting and ripping, cutting bevels and mitres and, as the blade is narrow and the work can be moved around it, cutting curves. Because the blade cuts downwards towards the table, the work tends to be held down by the cutting action and thus the risk of kickback is eliminated. 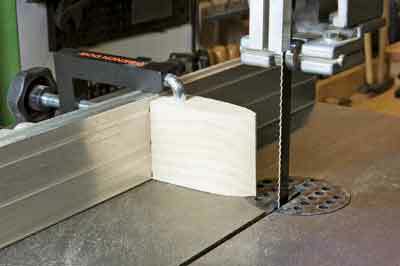 Bandsaws can therefore be safely used for cutting much smaller pieces than circular saws. 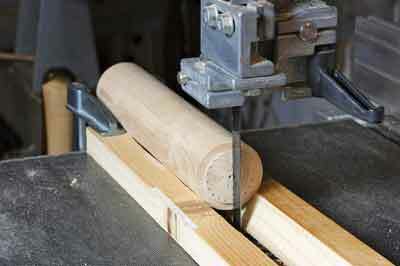 They can be used for a wide range of tasks from cutting veneers to making accurate saw cuts for dovetail joints. Compared to tablesaws they take up little space; for those with a small workshop or limited budget their compactness and versatility makes them an excellent choice where there is only scope for one machine. 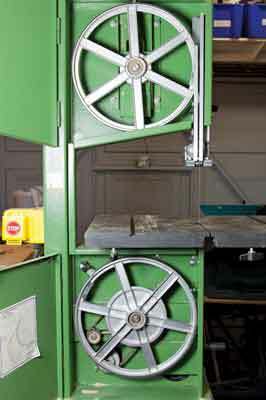 They range from small bench-top models to the vast bandsaw mills used in sawmills. I will look at mid-range saws with a depth of cut of around 150-200mm and a throat depth of 300-500mm, but the principles apply to most machines in the amateur or small trade workshop. A bandsaw consists of an endless steel blade with teeth on one side, which rotates around two or three wheels, the bottom one of which is driven by a motor. There may also be a facility to vary the speed for cutting different materials. 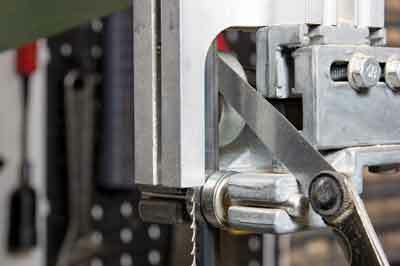 Adjusters are fitted to the upper wheel to enable tensioning and tracking of the blade which runs through a slot in a cast or pressed steel or aluminium table and cuts with a downward action. The blade is supported laterally above and below the table by blade guides which may take the form of blocks or bearings and it is prevented from moving backwards in the slot by means of thrust bearings. The whole upper blade guide assembly is adjustable to take account of the height of the work. The table, which will tilt to enable bevel cutting, is slotted to take a mitre fence and has an adjustable fence fitted to one side. 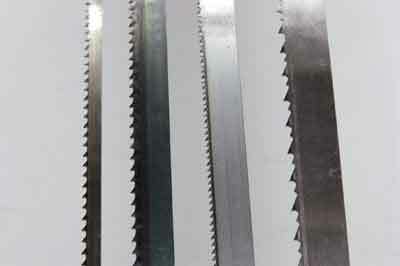 Bandsaws can be fitted with a wide range of different blade types depending on the work. Blade selection is a subject that warrants an article of its own as blades vary in width, tooth pitch - measured in teeth per inch (tpi) - and form - the shape and set of the teeth - but broadly speaking these principles should be followed. Straight cuts are best achieved with a wide blade while curves require a narrow blade. The tooth pitch required is determined by the thickness of the material; as a rule of thumb there should be no less than three and no more than 12 teeth in contact with the material at any time during the cut. Tooth form may be; 'standard', which is best for fine cutting and joint making; 'skip tooth' - every other tooth removed - which is better for rip cutting and curves; or 'hook-tooth', which is best for ripping in thick material and cutting veneers. Also worth mentioning are variable pitch blades where the pitch of the teeth changes from fine to coarse and back again. These are designed to reduce vibration when cutting thick stock. A good general purpose blade is a 6-10mm skip tooth blade of 4-6tpi, but for best results select a blade specific to the job in hand. 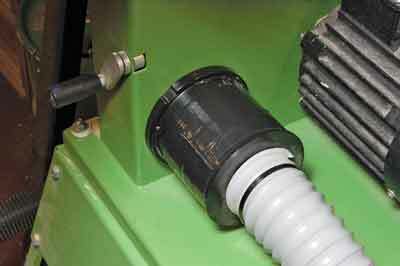 Some machines may be fitted with variable speed. 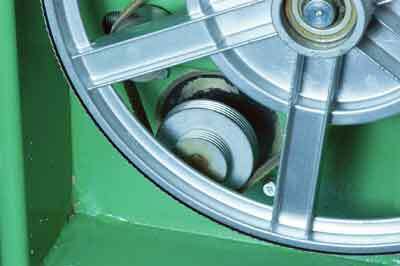 Higher speeds are used for thin or soft materials and for blades with coarser pitch. Slower speeds are used for hard or thick materials or finer pitched blades. 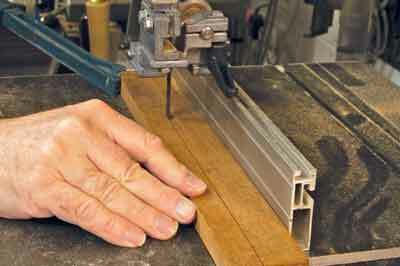 Most woodworking can be done at the higher speeds. I have only ever altered the speed on my own bandsaw for cutting metals. Correct tensioning of the blade is important to ensure accurate cutting and avoid placing unnecessary strain on the bearings. This is achieved by means of a tensioning device fitted to the upper wheel. Tracking the blade - positioning the blade on the wheels - correctly will ensure that the blade stays on the wheels and runs as straight as possible. Tracking adjustment is provided for by a mechanism that alters the tilt angle of the upper wheel. A good quality cast steel or aluminium table provides the best support for the work and ensures accuracy. 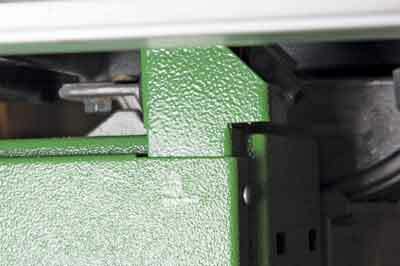 An insert around the blade is removable to allow access to the lower blade guides. The upper blade guide mechanism is fitted with blocks or bearings to support the blade and a thrust bearing to provide resistance to the cut. The whole mechanism is adjustable for the height of the work. 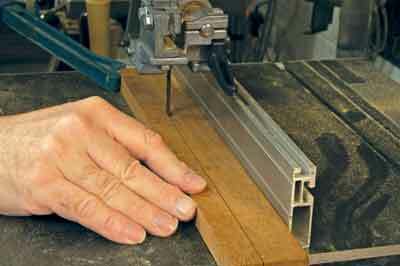 To achieve the best cuts the guides should be as close as possible to the workpiece. 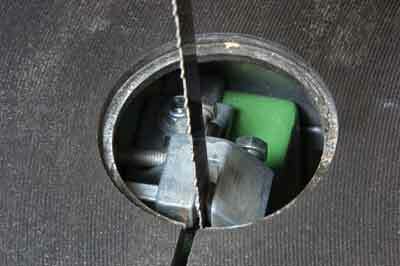 The lower blade guides, which may also be blocks or bearings, support the blade below the table. These are often metal blocks but may be replaced with blocks of hardwood, ceramic or other synthetic materials to achieve cooler running of the blade. 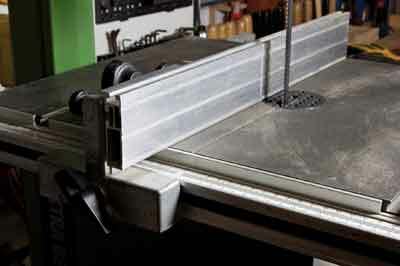 The table of the bandsaw is provided with a tilt mechanism which allows it to be positioned to enable bevel cuts. 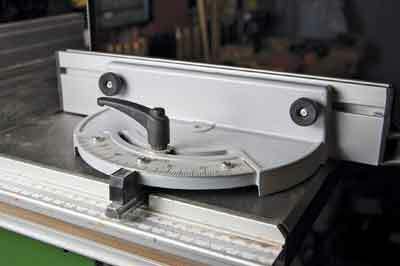 A mitre gauge which runs in slots in the table top will facilitate cross cutting and mitring. 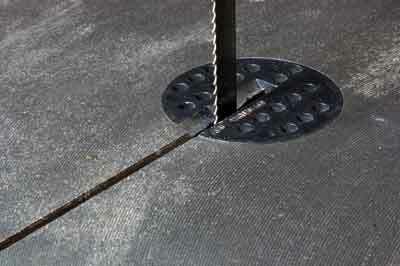 A fence is provided for ripping and accurate joint cutting. Better fences are adjustable to ensure squareness with the table top and their angle in relation to the blade can be altered to take account of any blade drift - a tendency for the blade to veer to one side when making a cut against the fence. A subsidiary 'single point' fence may be fitted to the main fence when cutting multiple curves or when resawing - cutting thick stock parallel to the wide face. 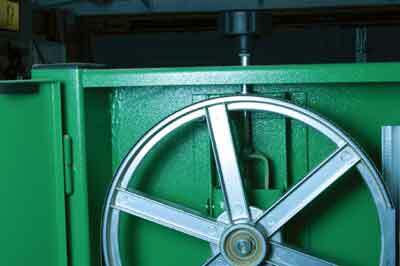 The wheels and other moving parts - apart from the exposed part of the blade - are enclosed within the machine casing, the access doors may be fitted with micro switches to prevent operation of the machine with the doors open. 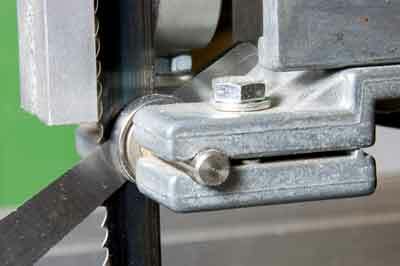 A guard is fitted to prevent contact with the blade below the table. An NVR switch is fitted so that in the event of power being disconnected the machine will not restart when power is restored until the start button is pressed. A pushstick is provided to ensure that your fingers never need to come close to the blade. I always leave mine on the table so that I have to pick it up before I can use the machine. 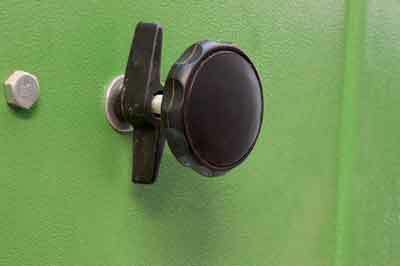 A dust extraction outlet is provided to reduce exposure to harmful wood dust. 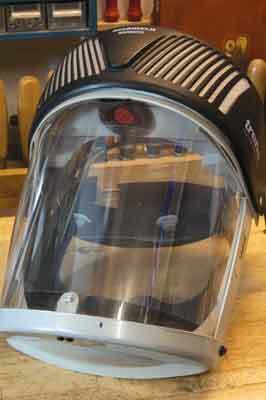 Bandsaws should always be used with a fine dust extractor to minimise health risks. 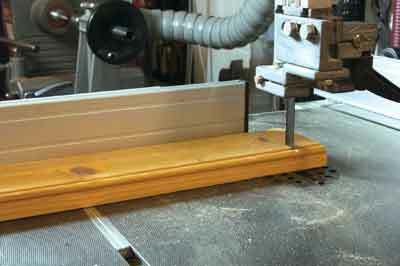 Bandsaws are extremely versatile but can be frustrating to use if not set up properly. Setting up the machine for accurate cutting is not difficult if these basic procedures are followed: before setting up, the wheels on your machine must be aligned with one another and running true. Check your machine's manual to see how to adjust this if necessary. 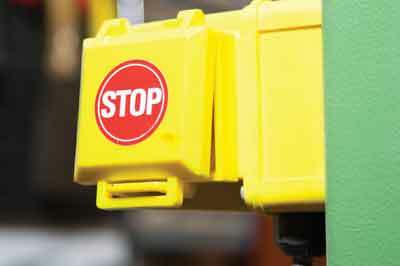 Always switch off and disconnect the machine from the mains before beginning any maintenance work. Begin by fitting the blade. In order to do this you will need to remove the fence and table insert, release the thrust bearings and guides and open both top and bottom access doors. Unfold the new blade - wear gloves and eye protection - and, with the teeth facing you, slide it into position on the wheels through the table slot. Next, tension the blade. 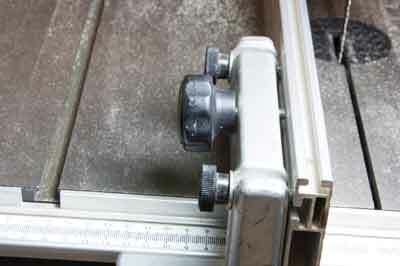 If the machine is fitted with an accurate tension scale or gauge then you can use this to determine the correct tension. 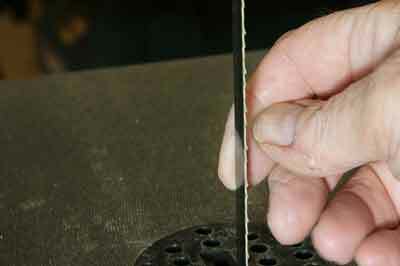 Otherwise you may gauge the tension by 'plucking' the blade until it gives a clear tone rather than a dull thud. This is difficult to describe but with a little experience you will soon hear the change in the sound when the blade is sufficiently tensioned. Next the blade must be tracked with the tilt mechanism. The blade will track towards the direction of the tilt of the top wheel. 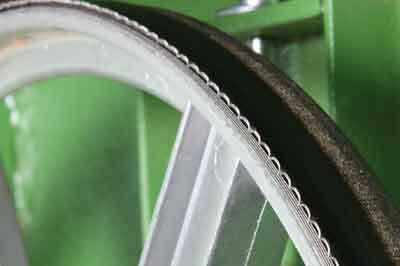 The tracking of narrow blades should be adjusted so that they run in the centre of the wheels. Broader blades should be tracked to run near the front of the wheels so the tips of the teeth are just clear of the tyre. Check that the blade is square to the table and adjust the table if necessary. Adjust the top and bottom thrust bearings so that they are about 0.4mm behind the blade. Use a feeler gauge or folded paper to set the spacing. Finally, set the guide blocks or bearings about 0.1mm from each side of the blade again using a feeler gauge or a single sheet of paper as a guide. Always wear eye protection, remove jewellery and tie back long hair or loose clothing. A dust mask or respirator is a good idea to minimise the risk from fine dust especially when using MDF and other manmade boards. 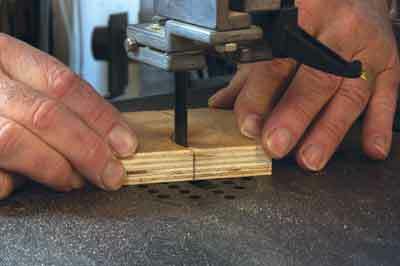 Unlike circular saws, bandsaws may be used for freehand work. Both hands should be used to guide the work and care should be taken to keep fingers well clear of the blade. 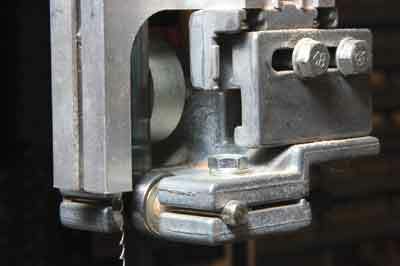 Jigs or clamps may be used to hold small pieces. 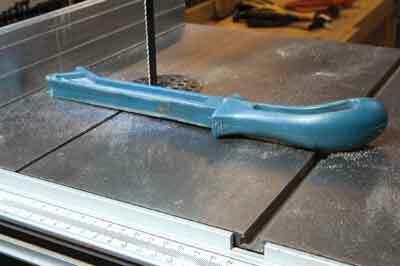 Crosscutting is best done using the mitre gauge for accuracy. 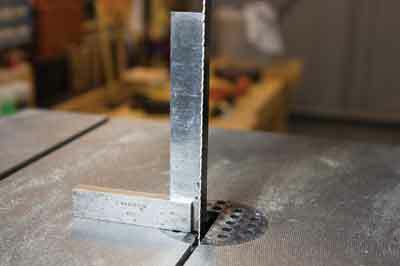 Clamping the work to the gauge will ensure it does not move during cutting, especially when using the table tilted for bevel cuts. Rip cuts are made using either a single point fence or alternatively, the rip fence. The rip fence should be adjusted to counteract any blade drift. 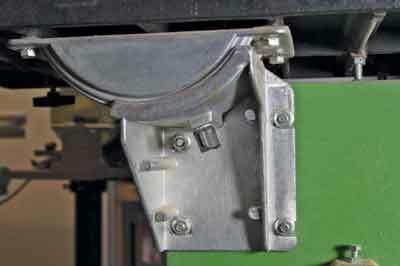 When cutting round stock suitable support such as 'V' blocks or a sled should be provided. The work should always be cut through the centre or the cutting action of the blade may cause the work to rotate.